Buccellati received the award for his exceptional conservation work at Tell Mozan (ancient Urkesh) in Syria and particularly for his efforts in the conservation of mudbrick—a notoriously difficult material to preserve. Mudbrick is extremely fragile and exposure to the elements causes it to deteriorate rapidly. The Royal Palace of Urkesh was built around 2250 B.C. by the Hurian king, Tupkish. Buccellati’s excavations at Tell Mozan began in 1984 and as part of his excavation process, he developed a method of covering the mudbrick walls with covers that protect them from sun, wind, rain and even snow. By doing this, Buccellati's team preserves the integrity of the excavated remains while simultaneously conveying the architectural concepts of the site. Buccellati says his experimental preservation efforts are “a bit like an experiment in 'real virtual reality.'" The covers are low-cost, renewable, locally constructed, and easily removed to allow for inspection of the walls. This innovative approach used at Tell Mozan combines archaeological research with creative preservation solutions and Buccellati’s ability to work with the local community, providing training and income, ensure a local commitment to the project that is critical to the long-term preservation of the site. Plans are also currently underway for the initial construction phases of an eco-archaeological park that will cover an area of some 25 km2 around Tell Mozan. The Archaeological Institute of America is pleased to present its 2011 Award for Best Practices in Site Preservation to Giorgio Buccellati. The Site Preservation Committee recognizes Buccellati for his exceptional work at Tell Mozan (ancient Urkesh) in Syria. Buccellati leads archaeologists and the field of site preservation by example through his responsible approach to the challenge of conserving mudbrick, by making conservation an integral part of the excavation process, and through his dedication to publication and dissemination of information. Also impressive is Buccellati’s innovative and efficient approach to protecting the delicate material he works with and his careful monitoring of the entire process. In training local workers and creating plans for an eco-archaeological park, he has demonstrated a strong commitment to the local community that the Archaeological Institute of America hopes his colleagues will strive to emulate. Buccellati is professor emeritus at the University of California, Los Angeles, a co-director of the Mozan/Urkesh Archaeological Project, and the director of the Mesopotamian Lab at the Cotsen Institute of Archaeology. As the author of articles such as "Urkesh: Archeologia, conservazione e restauro" (Kermes 13  41–8), “Conservation at the Core of Archaeological Strategy: The Case of Ancient Urkesh at Tell Mozan" (with S. Bonetti [The Getty Conservation Institute Newsletter 18 (2003) 18–21]), “Conservation qua Archaeology at Tell Mozan/Urkesh" and "Presentation and Interpretation of Archaeological Sites: The Case of Tell Mozan, Ancient Urkesh" (in N. Agnew and J. Bridgland, eds., Of the Past, For the Future: Integrating Archaeology and Conservation [Los Angeles 2006] 73–81, 152–56), Buccellati has demonstrated his commitment to sharing best practices with his colleagues for the betterment of the field of archaeology as a whole. 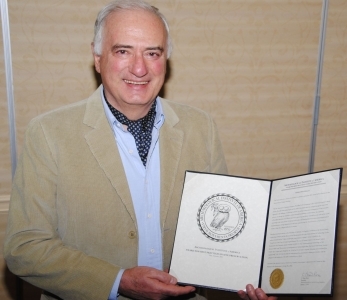 On behalf of the Archaeological Institute of America, it is an honor to present the 2011 Award for Best Practices in Site Preservation to Giorgio Buccellati.